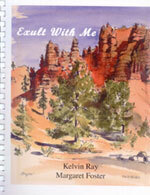 Exult with Me by Kelvin Ray and Margaret Foster. Karen published this book of her mother’s pen and ink drawings accompanied by Karen’s uncle’s poetry. 1st edition, July 2001, 2nd edition Sept. 2001. 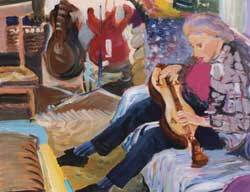 Mrs. D. R. Wells and Bali Hi, Harvest Hill Ranch, 14 x 18 oil on linen. Birdwatching. A guide for Beginners, authors Joan Easton Lentz and Judith Young, Illustrated by Karen. Capra Press Santa Barbara. San Luis Obispo County Trail Guide, Santa Lucia Chapter, Sierra Club, Illustrations by Karen and her mother, Margaret Foster. The Nature Conservancy of California, The Santa Cruz Island Interpretive Trail: Prisoners’ Harbor to Pelican Bay. Cover Illustrations Karen. Done in Adobe Illustration with help from Dave Butz design, for Herrmann’s Hot Chile Chocolate. These pen and ink drawings are just a few of a large collection that Karen did on Architecture. For more of this drawings, click here. Karen and Noreen La Point with this Donor Tile Mural on Santa Cruz Island at Stanton Ranch, CA. Tack store, named “Whitehorse”, in Templeton California. This was designed for their tee shirts. 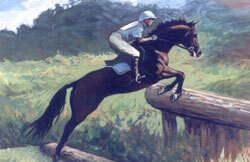 The Magazine is called Equine Vision and this articule is in the Winter 2002 issue.